When I was approached to create a beer and food pairing menu for Purecraft, the first thing that came into my head was my trip to Australia four years ago. Yes, I know when we think of beer and Australia it’s Foster’s that comes to mind, but you won’t find anyone drinking that there. While industrial lagers remain the dominant force, the country has been enjoying a craft beer revolution, particularly in Melbourne where I spent most of my time. It was there where my eyes were really opened up to the many amazing beers now available and how well food could work with it or even in it. Without a doubt the particular highlight and still best meal I have ever eaten was at the “Gypsy and the Goat” night, a dinner featuring beers from Melbourne brewery Mountain Goat and special guest and ice cool Danish mofo Mikkeller. It was five courses featuring two beers with each course, all served by waiters in matching Communist era clothing, taking instructions from a cigar chomping, bearded man on a platform overhead while we sat at a table setup for the night in the middle of the brewery floor. The whole night was incredible in every way, but for me the way the food was served and presented set it apart from anything else. I guess from there I definitely had a much broader interest in beer and food. It wasn’t until the job at Purecraft came up that I really had the opportunity to do something with beer and food. In the four years since returning from Australia, I have played around with a few ideas but nothing like now. I have been amazed at how much you can do with beer; it’s pretty exciting. When writing the menu there was a lot of experimentation and, believe me, a lot of things went wrong. We all know that beer batters work and everyone likes a good steak and ale pie but I wanted to do more than that and see where we could go with it. From my limited beer knowledge at the time, I always knew a few simple things such as taking beers over certain temperatures can ruin them, an example of that being the Purity Saddle Black beans we have on the menu. When I first tried them, I added the beer quite early and by the end of the cooking process they ended up very bitter and not very pleasant, so in the end we take the beans further than normal so they are a touch drier then add the beer right at the end of the cooking process. It works amazingly and the beer tastes great. Bitterness in beers I would say is the biggest problem. I tried to make a panacotta out of Cascade hops and it was possibly the worse thing I have ever made. I’ve since read that by somehow capturing the steam from hops you can use them in cooking. I am just waiting on my call back from Sat Bains as to when I can use his test kitchen!! Beer does not just need to be cooked into things for it to work. We do a lot of brining here, whether it be pork belly, chicken or my standout dish, the sea trout. I have always loved cured sea trout and done this way it’s great. From the moment I tried Purity Longhorn it was always my favourite of their beers: an amazing citrus and tropical fruit flavoured IPA. It was when scrolling through Instagram that I saw a chef curing salmon in passionfruit and lime. Visually, it looked incredible (filters help) but straight away I thought of the sea trout dish: Longhorn Cured Sea Trout, passionfruit, avocado, crispy shallots. I have to say it works incredibly well and we have had some great feedback on it. As a chef you forever learn and with the beers now too I will never stop learning. There are lots that we are trying and we will get to showcase them in June at a number of events. The standout one for anyone wanting to know more about beer and food pairing / tasting will be on June 30. 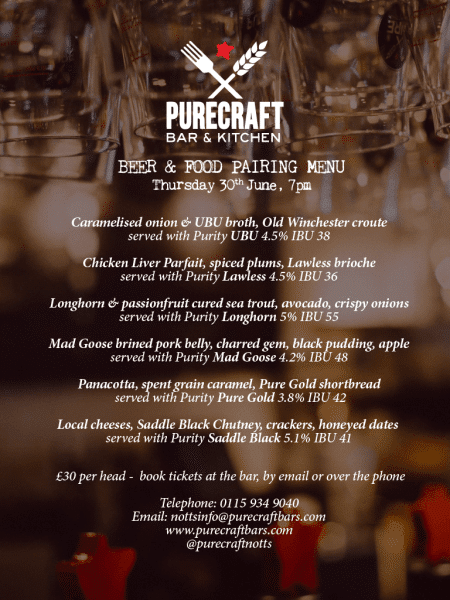 We are preparing a six course tasting menu using all six of the Purity beers across the courses.